The colonial house at 197 Eastlea Road sits on a property of nearly five acres and features geo-thermal heating and cooling. FAIRFIELD — Most people celebrate Earth Day on April 22 every year. The owners of the colonial house at 197 Eastlea Road is a tribute to the environment, sustainability and nature every day of the year. The house sits in a bucolic country setting in a family-friendly, walkable neighborhood. 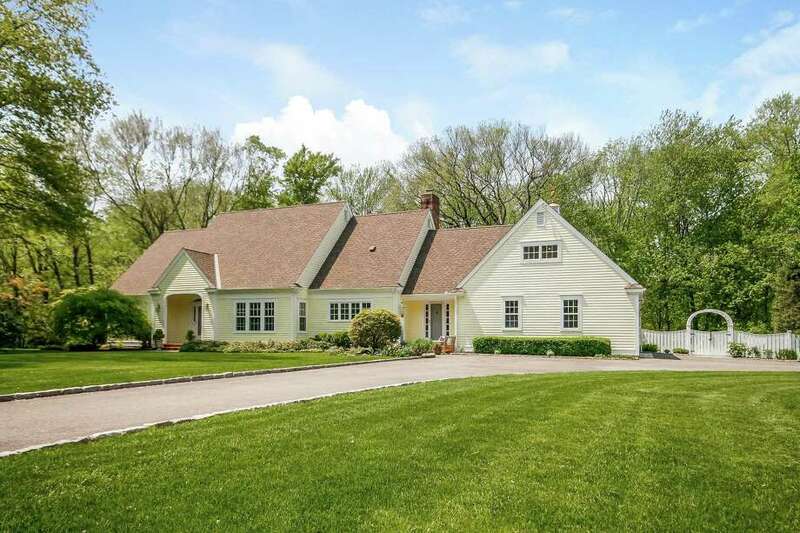 It is beautifully sited on a level property of just under five acres in the Greenfield Hill neighborhood and it features a zoned geo-thermal heating and cooling system, and in the backyard there is a heated Gunite in-ground saltwater swimming pool. Such pools require less maintenance than the standard chlorine pool and eliminates the need for storage of pool chemicals. The geo-thermal system reduces the overall energy cost by about 30 percent less than traditional heating and cooling systems, and it’s “whisper quiet,” according to the listing agent. This tranquil retreat is a nature lover’s delight and beyond its borders are two local facilities that further enhance the ability to enjoy outdoor pursuits. Within minutes of this house is the municipally owned Brett Woods Open Space. The wildlife conservation area features 185.7 acres including hiking trails, bridle paths, and camping. In the other direction is the Connecticut Audubon Society on Burr Street and its companion Roy and Margot Larsen Wildlife Sanctuary. “Within its 155 acres it contains a great variety of habitats and wildlife. The sanctuary has seven miles of trails that include the Chiboucas wheelchair-accessible trail for the disabled,” according to the Audubon website. It also has hundreds of species of birds and a pond. There is also a pond in the backyard of this serene setting. The pond is shared with a neighboring property. Although not visible from the house it is easily accessible. This level wooded and open yard also provides plenty of space for child’s play and lawn games, and the large bluestone patio around the pool is an ideal place for recreation, relaxing and entertaining. The yellow house with white trim and dentil molding was built in 1981 and it has been beautifully maintained and updated by its current owner for the past 22 years. To access this property travel down the long Belgium block-lined driveway to an ample parking area and the attached two-car garage topped with a cupola and whale weathervane. Walk down the bluestone path bordered by red brick, passing beautiful landscaping, to the two front entrances - the casual entrance and the formal front door, which is framed by decorative leaded glass sidelights and fanlight transom. The landscaping includes a wealth of perennials, among them Brunnera Jack Frost and hydrangeas. Inside, the foyer and formal dining room have parquet flooring. In the formal living room there is a gas-fueled fireplace, built-ins, and French doors to the backyard. Between the living room and family room there is a butler’s pantry with a wet bar, granite counter and glass-front cabinets. The family room has a red brick fireplace, built-in bookshelves and cabinetry, and paneling on the lower walls. In one direction it is open to the kitchen, which features a center island with a breakfast bar for three stools, granite counters, and high-end stainless appliances including a Thermador cooktop. In the other direction the family room is open to a large casual eating room, which then goes into a large sunroom with skylights, a ceiling fan, and sliding doors to the patio and pool. A door could easily be placed into one wall of the sunroom, which would then allow it to access the laundry room, powder room and mudroom; creating a cabana area for the pool. The powder room has an unusual, decorative bowl sink. In the laundry room there is a Tiffany-inspired stained glass window. Also found on the main living level is the spacious master bedroom suite. It features a generously sized window with views of the natural surroundings, dressing room, walk-in closet with organizers, and an updated luxurious bath with a double vanity with granite counters, soaking tub, and frameless glass shower. On the stairwell to the second floor there is a place to showcase plants that has special heat-absorbing glass windows. They provide an abundance of natural light while keeping the area cool in the summer and warm in the winter. There are three bedrooms on the second floor, all of them with hardwood floors and their own bathrooms. Should the next owner prefer a second floor master suite one of these bedrooms could serve that purpose. Above the garage there is a large recreation or play room that could also be an office. In the basement there is an exercise room, a workshop, and lots of storage. Outside, there is a garden shed with window boxes. While this property is clearly a private oasis it is only six miles from downtown Fairfield, shopping, restaurants and the train station. There will be a public open house on Sunday (Sept. 2), 1 to 4 p.m.
For more information or to set up an appointment to see the house contact Pam Baldwin Foarde of Al Filippone Associates/William Raveis Real Estate at 203-257-9110 or pamf@afahomes.com.